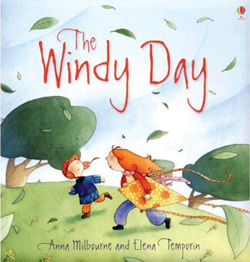 The Windy Day by Anna Milbourne, illustrated by Elena Temporin (Usborne Publishing, ISBN 9780746077719), encourages the reader to ask and answer questions about the wind. It is a great introduction to forces for Key Stage 1, and works well as a class book for Foundation Stage children as it identifies how best to feel the effect of wind. Other books in the series include The Rainy Day and The Snowy Day.